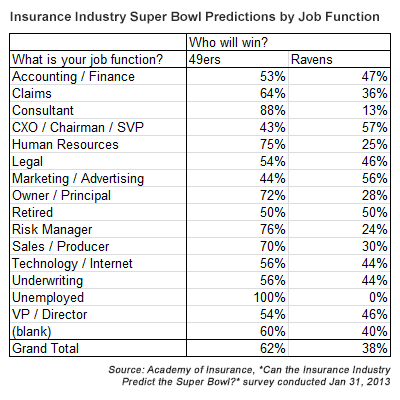 Insurance experts who make their living predicting and paying losses overwhelmingly believe that the Baltimore Ravens are headed for a loss in Sunday’s Super Bowl XLVII (47 for those who never learned Roman numerals). According to a quick online poll by the Insurance Journal Academy of Insurance, 62 percent of insurance professionals pick the San Francisco 49ers to win the Super Bowl over the Baltimore Ravens (38%). The results place the insurance experts in synch with Las Vegas oddsmakers who are also favoring the 49ers in the big game. “Of course, Las Vegas also picked the Denver Broncos and New England Patriots as the favorites to make the Super Bowl,” said Chris Boggs, director of education for the Academy. Sunday will not be the first time the Ravens have been seen as the underdogs. They were not favored to win either of their playoff games either. By insurance job function, the 49ers are heavily favored by risk management executives (76%), insurance human resource executives (75%), sales professionals (70%), and agency owners (72%). Underwriters pick the 49ers (56% to 44%) as do claims people (64% to 36%). On the other hand, the Ravens fair better with CEOs/chairmen, who pick them 57% to 43% over the 49ers, along with marketing/advertising people (56%). Producers and underwriters obviously had the most time on their hands leading up to the Super Bowl as these were the two largest groups of voters. These two groups combined to account for 51.8 percent of all voters. Not surprisingly, insurance people in California overwhelmingly favor the 49ers, 78% to 22%, but are outdone by Maryland where the vote was unanimous in favor of the Ravens. The Insurance Journal Academy of Insurance poll on the Super Bowl was conducted Thursday, Jan. 31. Result are based on 584 responses. Broncos For statistical purposes I'm in Underwriting. If there had been a category called "Who cares? 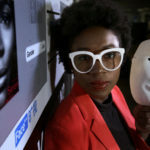 ", I would have participated.